Backhaul to the future – Can digital technology make Central Asia’s agriculture competitive? Whether matching drivers with riders or landlords with lodgers, digital platforms like Uber and AirBnB push the marginal cost of matching supply and demand to an unprecedented low. Large infrastructure projects like China’s One Belt, One Road Initiative - which aims at more closely linking the two ends of Eurasia, as well as Africa and Oceania - could create an opportunity to alter the future of Central Asia’s agriculture, if food supply and demand can be matched more efficiently. Jobs and wage growth have been the most important driver of poverty reduction globally, and Central Asia. In Tajikistan, for example, it has cut poverty by about two-thirds since 2003. In Kazakhstan, it accounted for more than three-quarters of income growth over the past decade — even among the poorest 20 percent. The other Central Asian nations have also achieved significant economic growth and poverty reduction in the past two decades due to income growth. But poverty-reduction rates have slowed. In Kyrgyzstan, they began slowing during the global recession of 2008, as income growth faltered. Poverty reduction in Tajikistan leveled off in 2015, when wage growth slackened and remittances from Tajiks working overseas fell. In Uzbekistan, more than 90 percent of the poorest households have identified lack of jobs as their most urgent priority. For these families, the prospect of increasing their income is slim, while the likelihood of transmitting poverty to their children is high. So what should countries in Central Asian do to build on their past achievements and prepare their citizens for the jobs of the future? It was an important reminder about the responsibility we have as a society to ensure that young people like him get the education they deserve. In light of the technological revolution we are witnessing today, the promise of education is becoming even more important. Emergence of robotics, autonomous transport, artificial intelligence and machine learning will transform the way we live, the way we work, and the skills we will need for work. Some jobs will disappear and some that don’t even exist today will become commonplace. What is certain is that education will be critical to succeed in the new reality. While Central Asian countries inherited high-levels of adult literacy and education attainment from the Soviet period, the region has since experienced a visible decline in the quality of learning. Students here often lag behind in such basic skills as critical thinking, reasoning, and problem solving. Togotoi is a small mountainous village in the south of the Kyrgyz Republic. Last month, some colleagues and I traveled there to participate in a ceremony to mark the opening of a newly-built water supply system. Mr. Askarov, Vice-Prime Minister of the Kyrgyz Republic and Mr. Sarybashov, Governor of Osh Oblast, opened the celebrations, signifying the high importance of this event for the local population. Togotoi villagers and school children celebrate the opening of their new water system. In my previous career at Lithuania’s Communications Regulatory Authority (RRT), I had the opportunity to observe how EU member states began to acknowledge and embrace the importance of cybersecurity. For many of them, though, it would begin with a major shock – a serious national-level cybersecurity incident. Since joining the World Bank, I have observed a similar trend across the developing countries. For instance, the Government of the Kyrgyz Republic has begun to place stronger emphasis on cyber resilience after a series of incidents, including digital vandalism of organizations’ websites. Among other considerations, also these cyber events led to the inclusion of cybersecurity financing in a World Bank $50 million Digital CASA (Central Asia-South Asia) – Kyrgyz Republic Project while, at the same time, the Bank catalyzed complementary grants for technical assistance to the government. One of these grants is the “Global Cyber Security Capacity Building Program”. We chose the Kyrgyz Republic as the first beneficiary country for the Program, and then others followed suit: Ghana, FYR Macedonia, and Myanmar. The financing came from Korea’s Ministry of Strategy and Finance (MoSF), through the Korea-World Bank Group Partnership Facility (KWPF), which is administered by the World Bank. As we take part in the 16 Days of Activism Against Gender-Based Violence campaign over the coming weeks, we couldn’t be more excited about sharing an update than this one. We recently brought a team of technologically savvy students together and worked hard for two days with very little sleep to develop an application to respond to sexual violence. The hard work paid off when our team was awarded first place in a Hackathon at the American University of Central Asia (AUCA). Doing Business and Central Asia – After 15 years, how much reform? This year, the annual Doing Business Report – by far the most anticipated and cited World Bank publication – celebrates its 15th year. Starting in 2003, the fledgling report, which covers about 130 countries, has grown into its teens garnering admiration and criticism in equal measure. Some absolutely love it, while others argue that its flaws outweigh its strong points. 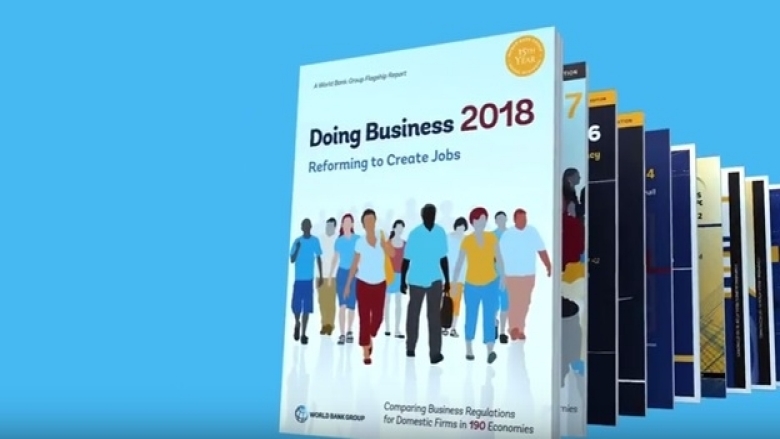 Regardless, nobody can deny that the Doing Business report has been a major catalyst for reforms across the world – 3,200 reforms of business regulation have been counted to date, spurred by the Report and carried out in line with the methodology of its indicators. With every calamity comes an opportunity: to rebound and rebuild stronger than before. The economies of Central Asia faced such an opportunity following the major economic shock they experienced at the end of 2014. The collapse in commodity prices affected not only oil-producing countries – highlighting the narrow production base on which their prosperity rests – but also oil importers, whose growth depends largely on remittance-fueled demand. All countries in the region experienced significant welfare losses. In 2015-16, the volume of imports declined 15% in both Tajikistan and Uzbekistan, and 25% in Kyrgyzstan – a clear sign that households and firms were constrained. After the initial shock, however, the economies of Central Asia rebounded. This was thanks to supportive fiscal and monetary policies, namely fiscal expansion and relatively lose monetary policy. Growth has picked-up: for Central Asia, as a whole, it is now projected to reach 4.4% in 2017, against 2.8% the year before. Inflation has returned to manageable levels: in Kazakhstan, it has plummeted down from the double-digit rates seen after the fall in oil prices, confirming that the previous spike was merely a one-time adjustment. But, have the countries of Central Asia done enough to shift the focus from structural constraints to durable prosperity? According to the recently released Economic Update for Europe and Central Asia, important challenges still lie ahead.